The Worthington Kilbourne High School Marching Band is the most visible performance ensemble at Worthington Kilbourne. 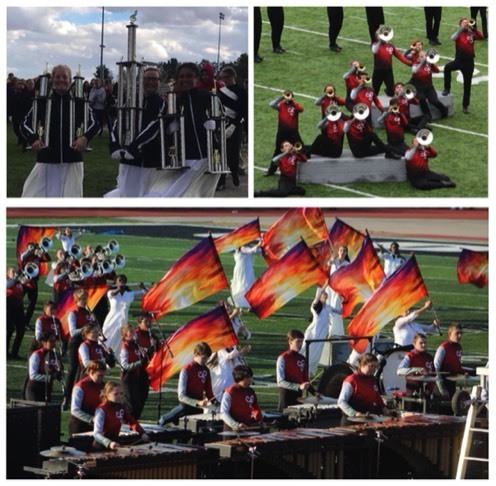 In addition to several community performances, the band performs at all Worthington Kilbourne football games and also competes throughout the fall at several marching band competitions around the state. During the past decade, the band has also traveled to New York, Hawaii, Florida and California. There are so many benefits to being involved in the marching band at Worthington Kilbourne... We have listed just a few of those benefits below. Freshman members get to know other Sophomore, Junior and Senior members of the band and will have a good group of people they know all before stepping through the doors of Worthington Kilbourne for their first day of high school. In addition, they will meet some of their teachers and be familiar with the high school before they start classes. It’s fun! We wouldn’t have any students and certainly wouldn’t have increased in size over the last few years if being in the marching band wasn’t fun! We perform at all of Kilbourne’s football games including traveling to away games... We travel to various high schools around Ohio for marching band competitions and also take some major trips periodically. The Kilbourne Marching Band has taken trips to Florida, New York, California and Hawaii over the last decade. We do not do these kinds of trips each season, but trips are definitely something we are always working on every few years. Students stay active and get involved with a physical activity instead of just sitting at home on the couch! This is so important for many of today’s students. Marching Band is considered a varsity sport and students completing two seasons will earn a varsity letter and physical education credit! Being involved in marching band looks GREAT on college applications! Colleges are always looking for involved and well-rounded students. With one season of concert band and marching band, students can check off their entire arts credit requirement for graduation! I’m taking honors classes next year. Will I have time for marching band? Absolutely! Our marching band consists of students taking honors classes, Advanced Placement (AP) classes and many of our members are also involved in the International Baccalaureate program (only offered at Worthington Kilbourne)! We have students that take these high level classes, participate in the marching band, concert band, jazz band and are even involved in varsity and junior varsity athletics during other seasons of the school year. It is certainly possible and very good for you to be involved. Getting into college is tougher than ever nowadays, and showing that you are an involved and well-rounded student looks great on college applications! I’m still on the fence... I just don’t know if I will like it. That’s fair... you have never actually participated in a marching band so how would you know if you will like it??? I will give you some numbers though... Over the last ten years of my teaching career as a band director, I have retained just over 98% of my students from year to year. Now, I’m not an expert or anything... but that’s a pretty good retention rate! If being in the marching band wasn’t a fun and rewarding experience, that just simply wouldn’t happen. Students that give marching band a try as an incoming freshmen end up loving their time in the group and come back year after year! The last thing I would like you to consider is that marching band is a commitment that once the school year begins, runs the last few days in August, then all of September, October and then we are finished the first week of November. If it is something you do not enjoy, it is over very quickly! Most of our students would say the season flies by! Obviously if you don’t enjoy it, you do not have to sign up the following year, and before even the first grading period of the school year is over, you are done with the marching band. However... I am extremely confident that you will enjoy your time with us in the band. Again, there is no way we would have our 98% retention rate if being in the marching band wasn’t an enjoyable and rewarding experience! I want to join the band for next season. What do I do next? The first thing you need to do is to contact Mr. Brough or Mr. DeFrancesco via email and let him know that you are planning to be in the marching band. This is VERY important because each member in the band has their own place in every formation of our competition show. Since we have our drill (formations) professionally written specifically for how many students we have, it is extremely important that we know you are participating well before our season begins. In this email, please include your name, instrument, complete address, phone number, and parents names. Your next step is to talk to your guidance counselor either at your middle school or your future counselor at the high school to get one of our concert bands and Marching Band on your schedule. Please note that all students enrolled in Marching Band must also be enrolled in one of our concert bands during the school day. It is important to contact the counselors, but it is more important to contact Mr. Brough and Mr. DeFrancesco first so that we can adequately plan on your participation for next season. The first commitment for all members (including freshman) of the marching band will be our Spring Camp, which starts the first week after school is out. These rehearsals are listed on our online calendar that is available by clicking here. This calendar will be updated adding more detail to our season schedule throughout the spring, but the majority of our important dates (especially our summer dates) are already set for next season and are already listed on the calendar. Is there a parent meeting that will have give me more information? YES! Every year in the spring, we setup a Marching Band parent meeting that goes over all information about our program. Typically it is in April. Check the calendar and main page to see when this meeting will be. During this meeting, we will go over our calendar, explain what we do, how we do it, talk about how parents can get involved and help out, how students can get officially enrolled and answer any and all questions new parents might have. We are excited that you are thinking of participating with our marching band. It is a great organization that you will remember being a part of for the rest of your life!